Food studies degree and certification programs have been steadily gaining popularity for decades, with New York University and Boston University being the first to establish their programs in the mid-1990’s. Today, some of the world’s most prestigious universities and colleges boast a variety of food studies programs and the number of graduates in the field increases yearly. This boom means food studies graduates are finding the industry continues to grow and change in exciting ways. The website GoodFoodJobs.com serves to connect those passionate about food with fulfilling work. Today there are nearly 30,000 jobs posted on the site. For the ever-increasing number of food studies alumni, here is Seedstock’s carefully curated list of meaningful and fulfilling career options. The wide world of food media is rife with opportunities for food studies majors. Food magazines, cooking television shows, and blogs are just a few of the ways people are using their education in food science to share their talents with the world. The innovators at RealFoodMedia.org are an example of the breadth and variety that exists in the food media field, with their production of films, webinars, presentations and more to educate audiences about sustainable farming. Many food studies majors trained in recipe development find fulfillment by personal working relationships with specific, repeat clients for whom they develop menus for on a daily or weekly basis. This career offers the chance for entrepreneurial endeavors, as many personal or private chefs own their own companies and work non-traditional schedules. Additionally, chefs who prefer more variety can find work as a for-hire private chef and take on short or long term assignments. Other food studies majors prefer to work in a more clinical setting, advising patients about health and nutrition to help them reach specific goals or make wise choices. These food studies majors usually direct their studies toward biology and nutrition classes during their programs, and dieticians must obtain additional certification in order to hold the title of dietician. Those interested in working in public policy can use their food studies education to influence the way food is produced, regulated, and distributed. Those working in food policy can work on a local, national, or international level and have the potential to affect the lives of millions. Researchers at the Johns Hopkins Bloomberg School of Public Health have compiled a list of more than 250 food policy councils in North America that work at the local and state level to affect food policy. According to a handout from the International Association of Culinary Professionals, a food historian examines and researches the juxtaposition between culture, food, and changing human customs and behaviors. Food historians can provide consulting services, write ethnographies and articles, and inform policy makers with their work. Food studies majors who have a knack for connecting with other people and aren’t afraid of public speaking do well as food tour guides. Food tour guides can be found in cities all over the globe and offer their tourists a unique and specially curated taste of a city’s culinary offerings. Guides with an entrepreneurial spirit sometimes develop their own offering of tours, rather than working for a touring company. These guides hand select restaurants and form personal relationships with the ownership and management to incorporate the restaurant into their tours. 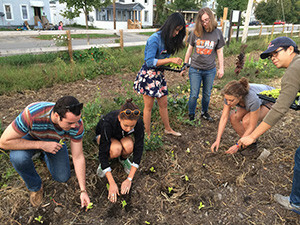 Food studies majors at the graduate level often go into academia, offering them a chance to use their knowledge to inform the next generation of food studies students. Food studies professors also conduct meaningful research about food in a variety of areas including nutrition, policy, culture and tradition, and more. Test kitchens are becoming more and more popular as some food studies majors desire to be involved in the production of recipes from the ground up. Those working in test kitchens use their gastronomy knowledge to create unique and original recipes for niche restaurants, cooking websites, and even television shows. While many people are familiar with the popular television competition show America’s Test Kitchen, the truth is many chefs work in test kitchens exist in cities all over the country and spend their time creating rather than competing. Food studies majors often go on to work managing and running high-end restaurants all over the world. These positions are reserved for those with the experience and discipline to manage a host of responsibilities in an ever-changing environment. Food studies majors who have a passion for wine can pursue careers as sommeliers. Sommeliers work in fine dining, advising individual customers about appropriate pairings for their meals. Sommeliers are highly trained professionals with a vast knowledge of wine and the complex relationship between food and beverages. Some schools have programs focused specifically on wine studies.